KYIV, Ukraine—Russia’s ongoing conflict with Ukraine has flared up once again. This time, however, it wasn’t another Russian artillery or rocket barrage in eastern Ukraine’s embattled Donbas region. 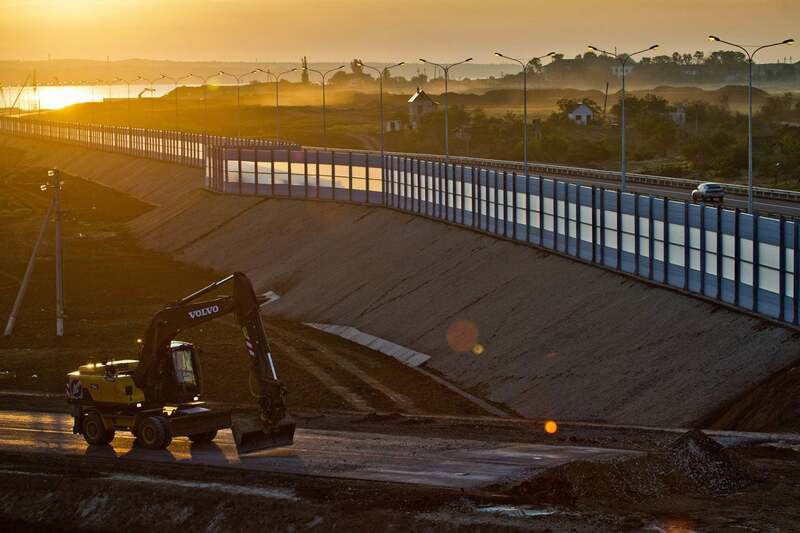 Rather, the latest escalation was evidenced by completion of a bridge across the Kerch Strait connecting the Crimean Peninsula with mainland Russia. 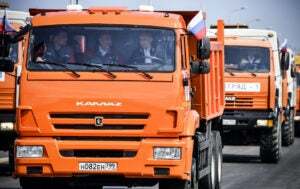 Russian President Vladimir Putin, true to form, got behind the wheel of a big-rig truck May 15 and led a convoy across the newly opened Kerch Strait bridge. “This bridge is not just a bridge. This is a tool for economic and political pressure on Ukraine,” Ukrainian Infrastructure Minister Volodymyr Omelyan said during a May 16 Cabinet meeting, Ukrainian agencies reported. Russia invaded and seized Crimea from Ukraine in 2014. As a result, the United States and the European Union levied economic sanctions on Moscow. Additional, separate sanctions were put on Russia for its ongoing proxy war in eastern Ukraine, as well as other acts of Russian aggression such as meddling in Western elections and a nerve agent assassination attempt against a former Russian spy on British soil. 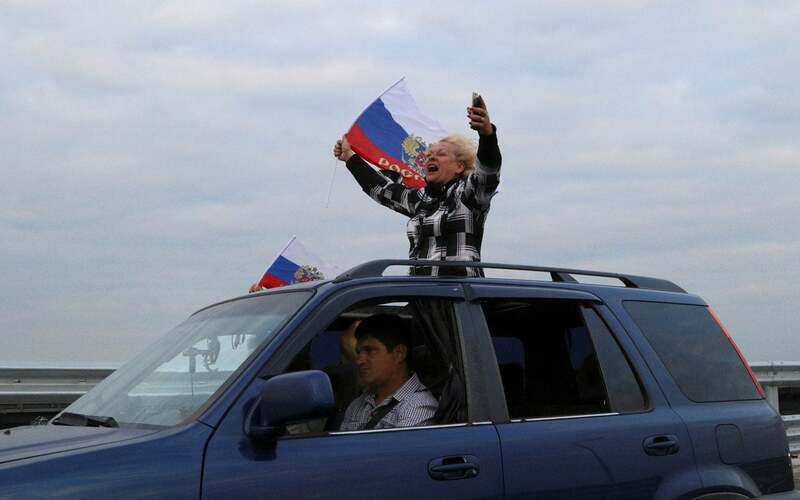 Moscow touted the new bridge as proof that Russian rule over Crimea is permanent. In a flurry of official statements May 15, the U.S., EU, and Ukraine roundly condemned the Kerch Strait bridge, calling it a further violation of Ukraine’s sovereignty. 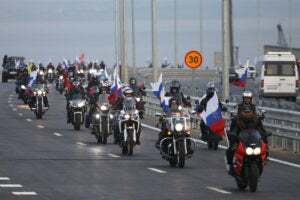 “For the Kremlin, the new bridge represents the physical reunification of Crimea and Russia,” said Agnia Grigas, senior fellow at the Atlantic Council. 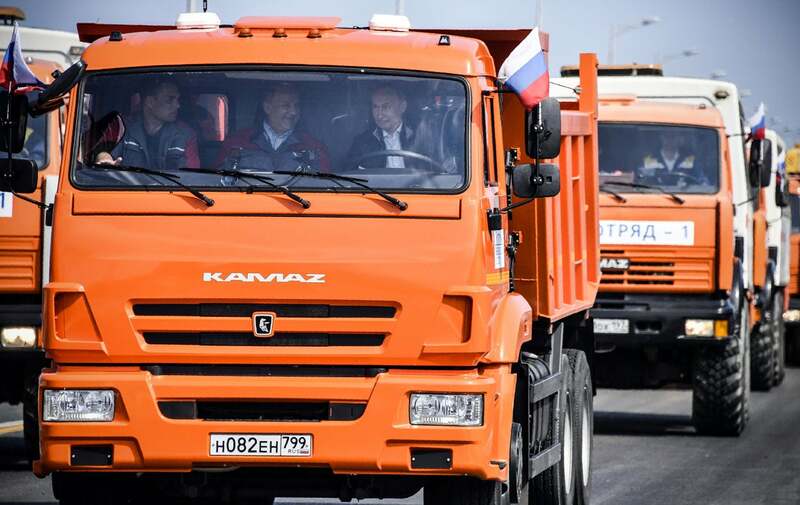 “The fact that the project succeeded despite Western sanctions targeting those involved in its construction demonstrates the limits of current Western capabilities to alter the situation in Crimea,” Grigas told The Daily Signal. The Russian public relations hoopla surrounding the bridge’s opening highlighted Moscow’s intransigence to back down from its territorial claim—as well as the ongoing value of Crimea to Putin when it comes to shoring up his domestic popularity. “What can [Putin] do? To return Crimea to Ukraine is unthinkable,” said Marcel Van Herpen, director of the Cicero Foundation, a Dutch think tank that specializes in Russian and European affairs. “In his own eyes, and also in the eyes of many Russians, this land grab is his greatest achievement,” Van Herpen said. In late February 2014, Ukraine was reeling from the Maidan revolution. Ukraine’s ousted president, Viktor Yanukovych—a Kremlin ally—had just fled to exile in Russia. Days later, Russian troops appeared in Crimea as part of a “hybrid warfare” invasion. 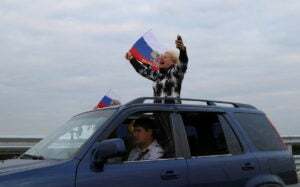 On March 16, 2014, under the watchful gaze of patchless Russian special forces troops (the “little green men,” as they became known in media reports), 95 percent of Crimean citizens supposedly voted in favor of joining the Russian Federation. The international community widely condemned the referendum as illegitimate. Putin, however, claimed the people of Crimea had turned to Russian for help. According to news reports, only 10 United Nations members have recognized Russia’s annexation of Crimea as legitimate. Those 10 countries are: Afghanistan, Bolivia, Cuba, Kyrgyzstan, Nicaragua, North Korea, Sudan, Syria, Venezuela, and Zimbabwe. Following its illegal annexation of Crimea, Russia launched a proxy war in the Donbas in April 2014. That war is ongoing and has so far killed about 11,000 Ukrainians. Ultimately, Russia’s 2014 invasion and annexation of Crimea was a popularity boon for Putin within Russia. Prior to the Crimean invasion, Putin’s popularity ratings were in the low 60s, news reports said at the time. By July 2015, according to polling by the Levada-Center, an independent Russian research center, Putin’s popularity rating within Russia was at 89 percent—his highest approval rating ever. “This bridge is part of Putin’s strategic vision of resuscitating the power of both the Russian Empire and the former USSR, a very compelling image in the imagination of the Russian people,” Fatima-Zohra Er-Rafia, a corporate consultant and researcher who specializes in Eurasian affairs, told The Daily Signal. For their part, the U.S., Europe, and Ukraine are collectively standing their ground, insisting that Crimea remains sovereign Ukrainian territory and that Russia’s occupation is illegal. “Words matter, and what we need is to name and shame—not only Russia, but also those who recognize Russian authority over the peninsula,” Daniel Szeligowski, senior research fellow on Ukraine for the Polish Institute of International Affairs, told The Daily Signal. To that end, Ukraine and its Western partners swiftly protested the May 15 opening of the Kerch Strait bridge. 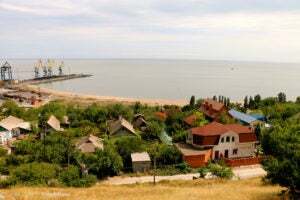 “The construction of the bridge, like any other actions of the Kremlin’s occupying authorities, in no way can change the status of the Autonomous Republic of Crimea and the city of Sevastopol as an integral part of the territory of Ukraine in its internationally recognized borders,” the Ukrainian Ministry of Foreign Affairs said in a statement. “Crimea is part of Ukraine, and its annexation by Russia is a breach of international law,” U.K. Minister for Europe Sir Alan Duncan said in a statement on the opening of the bridge. “The Russian Federation has constructed the Kerch Bridge to the Crimean Peninsula without Ukraine’s consent. This constitutes another violation of Ukraine’s sovereignty and territorial integrity by Russia,” the European Union said. 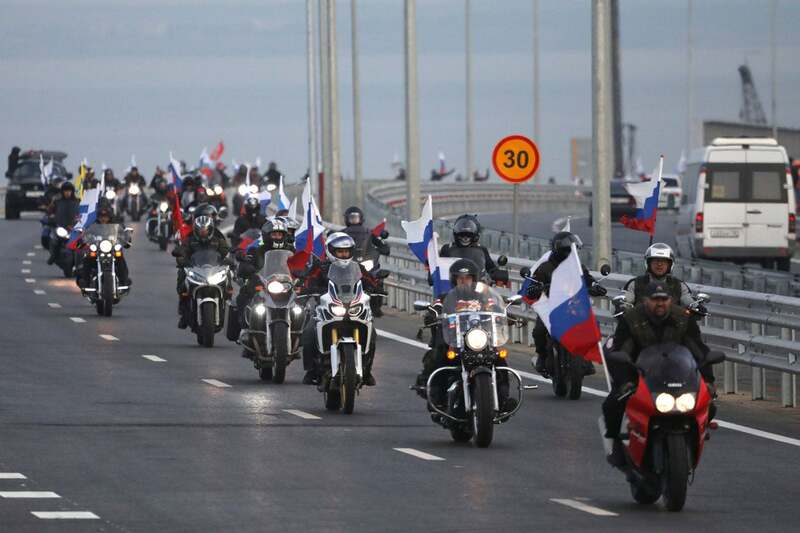 Today Russian President Vladimir Putin has officially dedicated the first section of the Crimean Bridge. As one could predict, Washington is not happy with that. But Crimea is Russia. We shall not ask for anybody’s permission to build transport infrastructure for the sake of the population of Russian regions. Some say Ukraine and the West have hit a de facto ceiling on the pressure they’re willing to exert on Russia for its seizure of Crimea. Going forward, the future of Crimea is a pickle for all parties involved. Ukraine and the West don’t want to acknowledge Russia’s annexation as permanent. And, for domestic political reasons, Putin won’t likely reverse course and return the territory to Ukraine. “It is most likely that the West will pursue a nonrecognition policy for Crimea’s annexation—similarly as they had pursued regarding the Baltic states during the Cold War period—and hope for a change of political climate in Russia,” the Atlantic Council’s Grigas said. Meanwhile, fighting continued along the 450-kilometer-long front line in eastern Ukraine’s Donbas region. Ater more than four years of constant combat, Ukrainian forces remain engaged in a low-intensity, static war against a combined force of about 35,000 pro-Russian separatists, foreign mercenaries, and Russian regulars. The day of the bridge opening, combined Russian-separatist forces fired mortars at the Ukrainian government-controlled village of Novhorodske in eastern Ukraine. The Ukrainian military reported one soldier killed in action and two others wounded. Thursday, the Ukrainian military said combined Russian-separatist forces had attacked Ukrainian positions 66 times in the preceding 24 hours, including with mortars and Grad multiple-launch rocket systems. 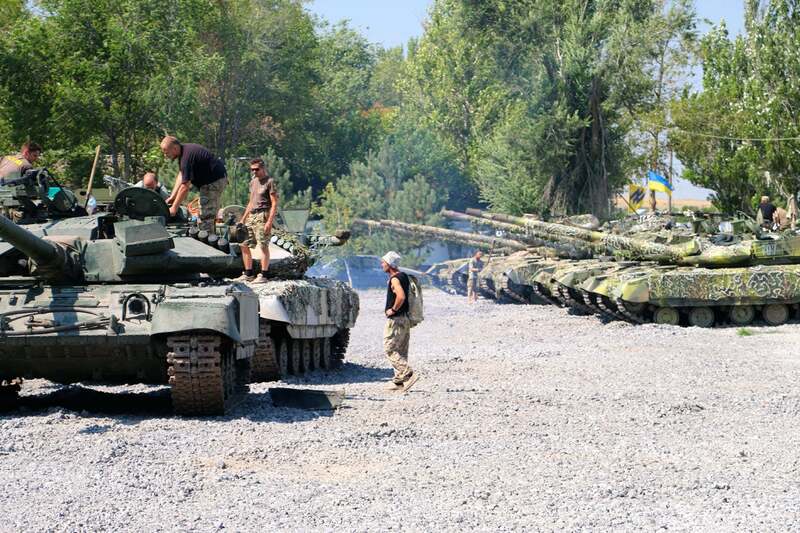 Two Ukrainian troops were killed in the attacks, and four more were wounded. Also Thursday, combined Russian-separatist forces shelled an elementary school in the town of Svitlodarsk on the Ukrainian government-controlled side of the front lines. No children were killed or wounded in the attack, officials said. “Schools and children are not a target and must never be attacked,” Miladin Bogetic, spokesperson for the International Committee of the Red Cross, wrote in an email to journalists. U.S. and European diplomats generally see the ongoing war in the Donbas as the priority for negotiations with Russia. Still, U.S. and European diplomats have made clear that sanctions levied on Russia for its invasion of Crimea are separate from those put in place due to the war in the Donbas. The relief of Crimea-related sanctions will occur only after Russia returns control of the territory to Ukraine, officials say. In short: Crimea will not be traded for peace in the Donbas. “It is indispensable to maintain and even reinforce the sanctions regime,” Van Herpen told The Daily Signal. Even with the sanctions regime in place, Ukraine and the West have limited options available to force Russia’s hand to relinquish Crimea. “The Crimean Peninsula will not return under Ukraine’s control in the short-to-medium term,” Szeligowski, of the Polish Institute of International Affairs, said. Acknowledging Moscow’s permanent control over Crimea would be a diplomatic retreat for Kyiv that would undermine the legitimacy of its post-revolution government and likely spur domestic unrest. For the West, conceding Russia’s control of Crimea as permanent, or legitimate, would be a body blow to norms of geopolitical behavior that have underpinned international relations for decades, and which, some say, have prevented another global conflict on par with the two world wars. Thus, the week’s volley of diplomatic jabs underscores what will likely be the status quo for the time being—a war of words fought through the media. 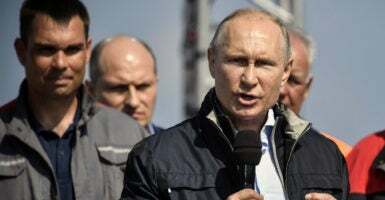 Many security experts and Western government officials say no real progress toward returning Crimea to Ukraine is likely to happen while Putin is in power. Still, according to that line of thinking, the sanctions regime against Russia should be maintained with an eye toward influencing a future Russian government, which might be willing to trade Crimea back to Ukraine in exchange for sanctions relief, or as part of a broader reconciliation deal with the West to end Russia’s international isolation.